So the basic plan was to leave from our starting points and meet at the Sky Bridge Station at (or as close to) 12:00 PM. There were 4 of us starting from E.P. Tom Sawyer Park on the eastern side of Louisville. 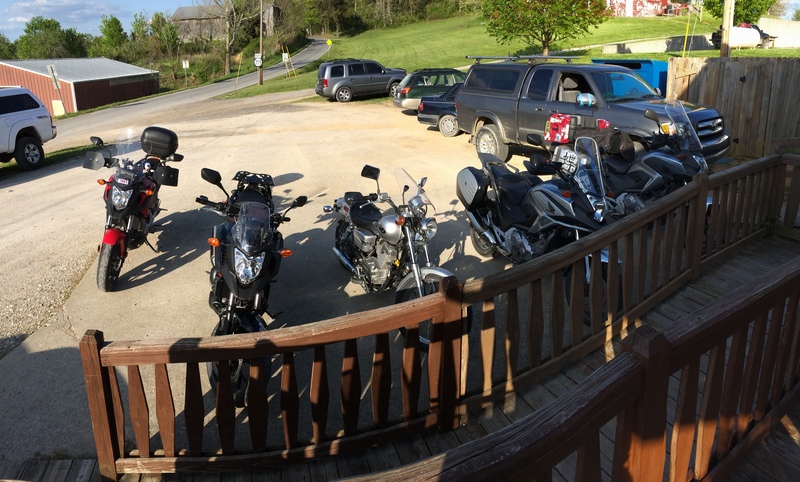 2 NC’s (mine and one from Indiana), the Rebel and the SV650. We left out at just after 8:00 AM. Minor pause so I could buckle my helmet… Out route was identical as the last time, taking us through Eminence via 22 and then on 421S into Frankfort. In Frankfort, however, we got rerouted to the point even the GPS said “Screw it!”. It was Derby weekend, and the state police had many roads in Frankfort closed off to allow for the governor to get on his train and ride into Louisville for the KY Derby. It cost us a few minutes, but we got back on track easily enough. From there, we skirted Georgetown via some small roads going through a bunch of horse farms (fitting) and then skirted wide around Lexington as we headed into Winchester. It was a great ride, and the weather was perfect. A quick gas stop outside of Winchester and then back on the road. We still had about 50 miles yet to go. We expected to be routed onto KY15, however it took us a completely different route on some 3 digit and 4 digit roads. It was worth it, however. And this is probably both my high point and low point of the trip. We crested the top of one of the knobs (not quite a mountain, but bigger than a hill) and the vista we were rewarded with was one of the most beautiful I had ever seen outside of the Rockies. Clear blue skies with small high fluffy clouds over a valley with tall hills all around it and nothing else in sight. I was so taken aback that I could not stop, but just kept driving. It was a good thing there was no one in front of us and I never even looked at the road for about 1/2 mile. My regret was not turning around back to the top and taking a photo. This is a spot I will make a run for just to get the photo. Even now, it looks as good in my head as my eyes saw it. Everything was downhill after that. Literally, not figuratively… We passed through some small towns and got onto KY15 that headed to the Sky Bridge Station (which sits at the corner of KY715 and KY15. 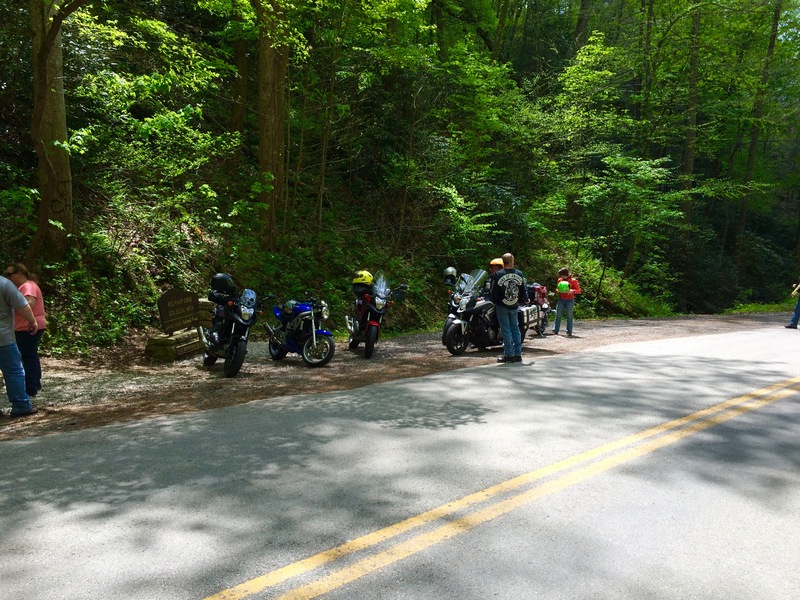 We arrived shortly after 12:30 PM and met up with the other 2 riders on their NC’s. 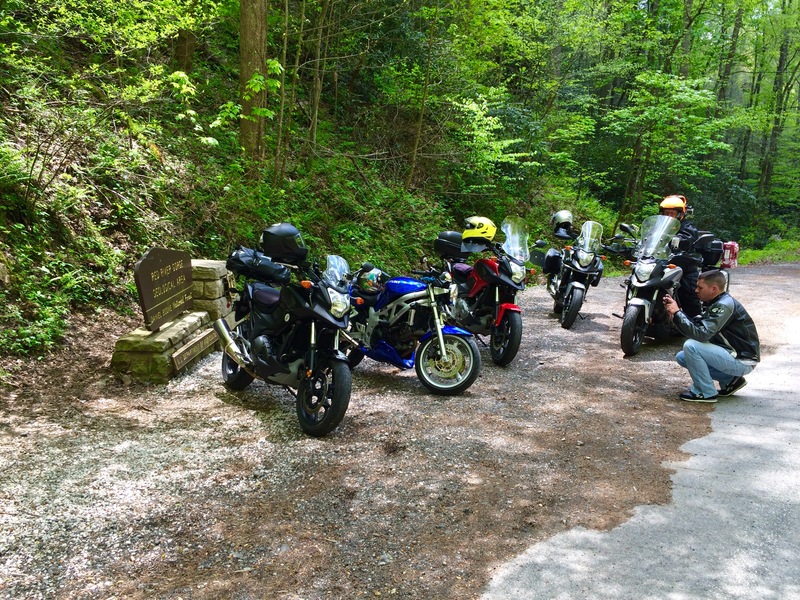 Since most of the group had never ridden in the area, we decided to start with the Nada Tunnel Loop (US715, basically) and then do the Nada Tunnel Ridge road (gravel) to hit the overlook. We dropped off our gear in the room and headed back out. The temperatures were perfect and even the cager traffic was light. At one point, we started passing a group of motorcycles coming the other way. There must have been every bit of 150 of them, if not more. Got to the point I just sat my hand on my handlebar with 2 fingers raised as it was tired from waving. They all had smiles on their faces, too. We think it had to be a poker run or charity ride. 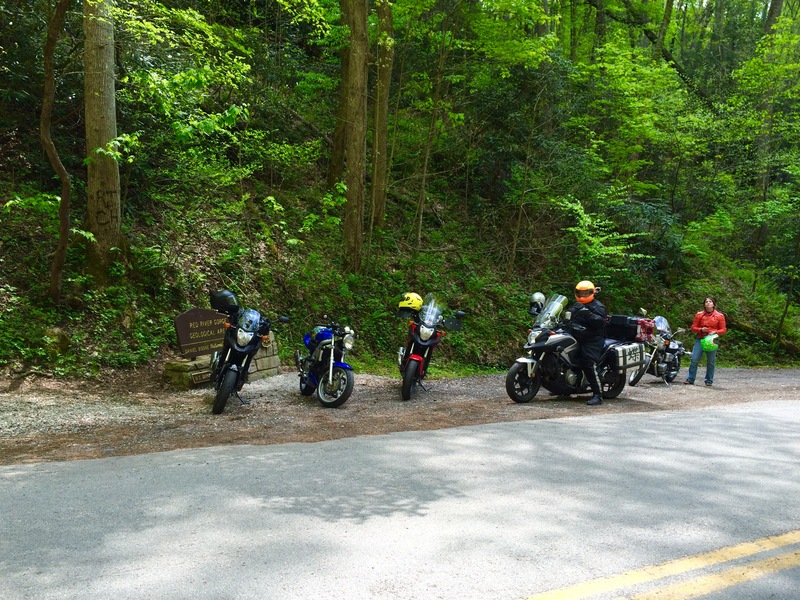 We got around, through the tunnel and then pulled off to get some shots of the bikes at the tunnel. After that, we got some fuel and headed off for the overlook. It was the first gravel for a couple of the riders, and everyone stayed on their bikes. 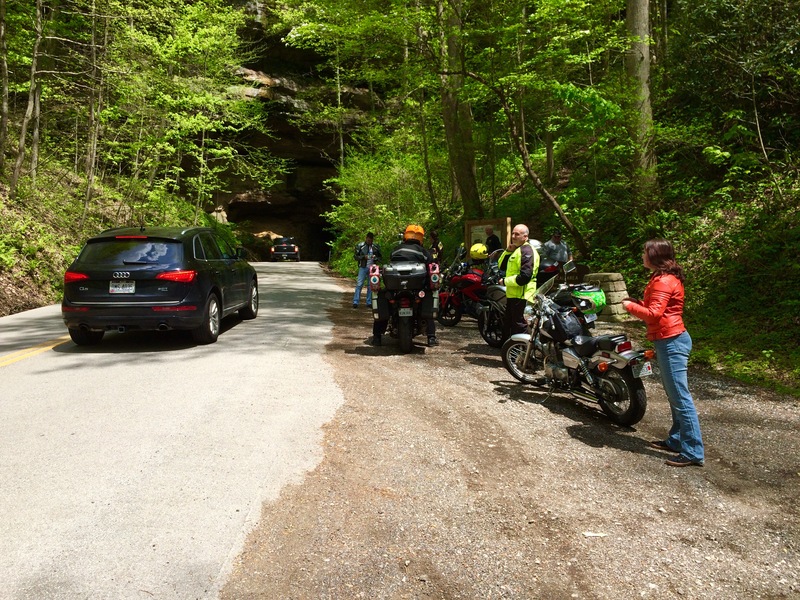 From there, we scooted down to check out what there was to see in Natural Bridge. Unfortunately, we did not find an easy ride in to the actual bridge, so we rode KY11 for a while. Got to a stopping point and everyone was ready for food. We turned back around and headed down to a well known, and busy, pizza joint; Miguel’s Pizza in Slade, KY at Natural Bridge. OMG it was fantastic, and filling. Now, I didn’t see much of the road into Miguel’s after we turned around because at some point, a little black spider had gotten into my helmet and decided to camp out between the face shields. Yep, lets say I nearly jumped off the bike at speed… We got parked, got in line for the pizza and I was still shaking when we finished eating. Got back to the bike and he was sitting on the edge so I was able to blow him off the helmet without issue. If he hadn’t, I would never have been able to get him out, he was where the inner shield retreated into the helmet. After we got done, one of the riders wanted to get a shot on the loop where some very large boulders were sitting by the road. We went back into the loop from the other side (we were closer) and through the tunnel again. about 40% of the way in, we got the shots and continued back to the Sky Bridge Station. It was at the point it was getting dark in the Gorge, so we decided to call it a day and got changed and started the beer and relaxation. Oh, on a note, the gentleman from Texas had been regaling us at every stop with different stories. All of which were side-splitters. The evening was nothing different.We had so much fun and laughed so much it hurt to move. 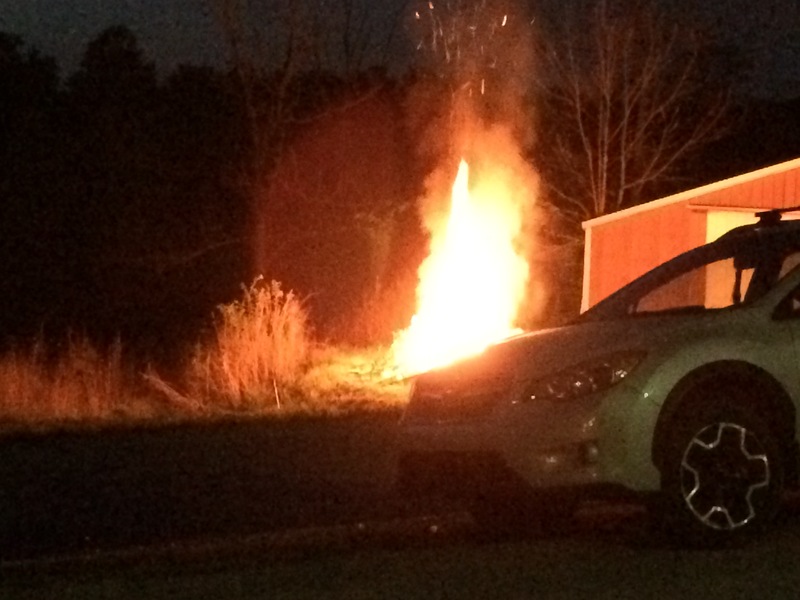 Through out the evening, we were also entertained by some of the locals who tried everything they could to flip their dune buggy into a huge fire they had built. Fortunately for them (not us) no one flipped the buggy… Everyone turned in about 11:00 PM and by the time I got up, there were only 2 of us left. It was a lazy morning pulling out. As no one was at the Sky Bridge Station, and would not be until Noon, we decided to leave the cash with a note and contact info, just in case. 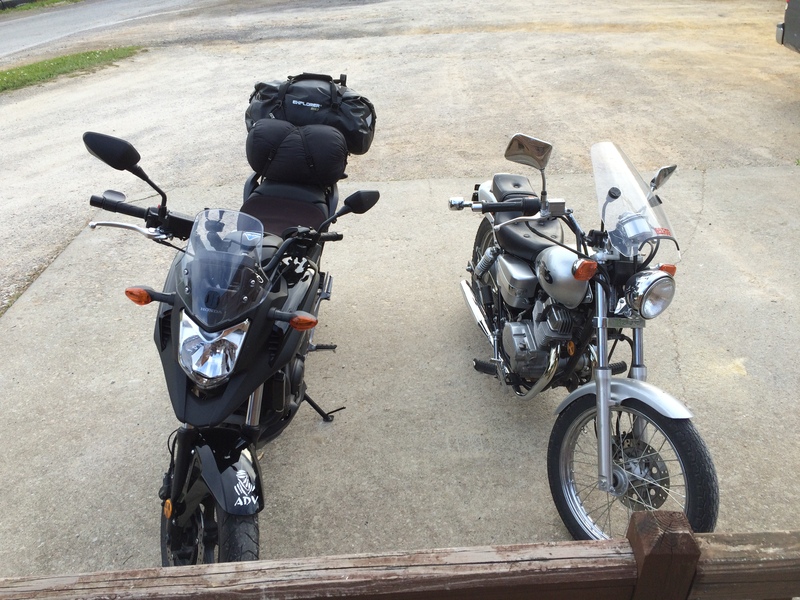 We got our bikes (my NC and her Rebel) packed up and pulled off for home about 9:30 AM. Still early, in my book. The route we were going to take was gonna take us through Richmond, Danville, Taylorsville and then home to Louisville. With a couple stops for gas (the Rebel had about 120 mile range, and we played it safe stopping at 100) and a quick lunch break in Danville, we got back into Louisville around 2:30 PM or so. Overall, it was fantastic weekend, and everyone has said they would do it again. Well, almost everyone, I think Texas is still on the road home. I am planning on making this an annual ride: Derby Escape Ride. The SBS has 2 rooms, one with 5 beds and one with 6. Next year, with planning, I would like to see all 11 beds full with people possibly sleeping on a couch or camping as well. It is an easy ride from many locations, including Louisville, Cincinnati, Tennessee, Southern Indiana and Western KY. There are a lot more roads down there than we even touched on. 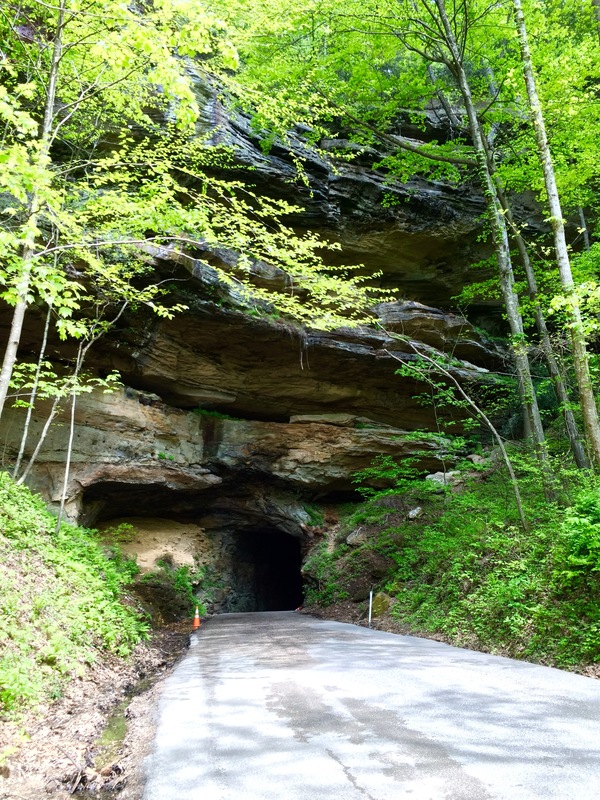 Eastern Kentucky has some gorgeous scenery and roads, so many you can spend weeks and not hit them all. Next year, I may schedule it to ride down Friday night so we can get up early Saturday morning and spend all day out on the roads. There is the entire eastern side of the Gorge we didn’t even touch. Contact Sky Bridge Station at the link below for information on their lodging – it was perfect and the staff was awesome. Abandoned – Country house in the city.